Combine the carrots, ginger, sugar and nutmeg, transfer to a baking tray lined with baking paper. Bake for approx. 10 mins. in the centre of an oven preheated to 160°C. Remove from the oven, turn the heat up to 180°C. Combine the pecan nuts with all the other ingredients up to and including the salt, transfer to the baking tray with the carrots, mix. Approx. 25 mins. in the centre of a preheated oven, turning 3-4 times. Remove from the oven, leave to cool. 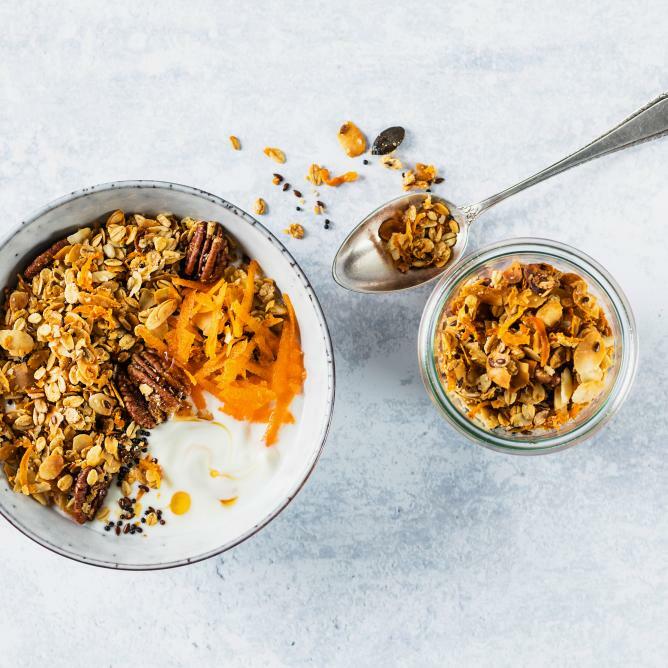 Place the yoghurt in bowls, top with the carrots and granola, scatter over the reserved lemon zest, drizzle with honey. Keep in an airtight container for approx. 2 weeks.